To create content that engages audiences beyond your current supporters, put your efforts into spotting, creation, distribution and listening. Organisations are getting better and better at generating steady streams of topical, relevant content for their campaigns and initiatives. But many struggle to communicate in ways that take advantage of one thing that makes the internet such a powerful medium – everything is shareable. With input from some of the world’s leading social media practitioners, we developed this guide in 2013 to help digital campaigners and practitioners apply tried-and-true methods of making social media content that actually spreads. Although some of the tools highlighted below have come and gone since then, we believe the overarching principles remain as relevant today as when this was first published. Summary: Find out what’s happening internally and externally, what people are talking about online (or what they should be talking about) — then decide which of those things to promote. Roles: 2-3 people who are empowered to make social media decisions spending 20-40 minutes each morning assessing the current landscape of choices on their own and meeting together to decide what to campaign on. This group brainstorms and decides on the actual concept and angle of the specific content to develop. Topsy and Topsy Pro for content/keyword monitoring. Personal Twitter and Facebook feeds (Tweetdeckcan be great for this — here’s an example of the screen on a lot of Greenpeace International monitors). Personal conversations and what friends are sending around. Tumblr can be a helpful way to gather possible campaigning topics. Why We Choose guidelines (see image to the right for Upwell’s high-tech rubric). Past results gathered from Radian6 (Salesforce Marketing Cloud), Topsy Pro, and others. Summary: Create the actual content you want to promote. it should be remarkable in some way, so that it’s something people will want to share — maybe it’s surprising, it makes the sharer look smart, cool, or something else (though note that “remarkable” does not require “perfect” or “professionally designed”). Make sure to think through the whole packaging, using a caption and landing pages that maximize sharing. Note: If designed to spread to new audiences, it should probably be very light on branding (or avoid it entirely), though a well-chosen hashtag, where appropriate, can help put it in a wider context. Consider if it makes sense to pair it with an action; if it’s inspiring or funny on its own, it may be less necessary, but if it’s depressing or sad, there should be some outlet for the viewer to change the situation. Roles: Within the “awesome spotting” team that’s decided on the main concept, there needs to be at least 1 person who can then write and design well to create reviewable drafts, along with an editor/approver. 30 minutes or so per piece of content is a good guideline; the basic rule is not to let any single thing take up too much time. Tools: Design software and word processor of choice. Summary: Get that content into the world! Use your organizational channels when it makes sense, but don’t forget to build up a network of staff who can help with promotion, too, as well as other channels your leadership might have. And, crucially, since your content is geared to spread outside of your direct network, you’ll need to intentionally build new relationships and networks of people and organizations you can ask to share your content — both online and with actual, human-to-human outreach.Then, whenever shareable, brand-neutral (or close to it) content is generated, it can be spread via this broader network with much greater combined reach. Roles: One person to post the content and send it out to the networks you’ve built, and one person to actually build the network. This could be the same person! Bit.ly for link creation (by adding a “+” to any url, you get instant analytics!). Beyond that, you’ll want to create a mechanism (email, most likely) to easily get packaged content out to your network. Summary: Here is where you figure out how well you’re doing — and what to do differently next time. In addition to reporting back on performance of specific posts, accounts, and campaigns over time, this is where you should track the broad conversations you’re hoping to affect and see when issues are taking off or resonating in a way the “awesome detection” system isn’t necessarily catching. Roles: At least 1 full-time person if you want to be doing the full conversation tracking and impact analysis, and one or two others who can chip in at times. Radian6 is really the only tool out there capable of the broad, nearly-internet-wide conversation tracking you *should* feel like you need. 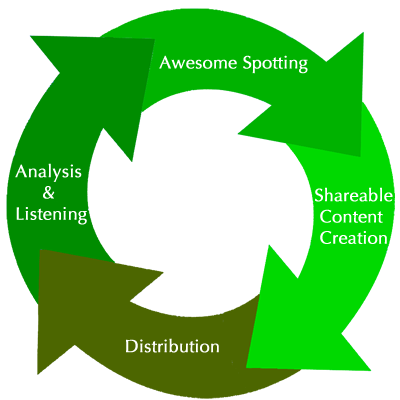 There is plenty of content that should be part of a social media strategy that does not require these four steps/functions. Most notably, content that is *not* intended for an audience beyond our current direct reach does not require an approach like what’s described above. High-level volunteer asks like an organizing fellowship, turnout for a rally or other event, canvassing, etc. Organizational updates like a new executive director, an office opening, some honor, etc. These could be useful for a very engaged audience, but shouldn’t be thought of as interesting beyond that inner circle.